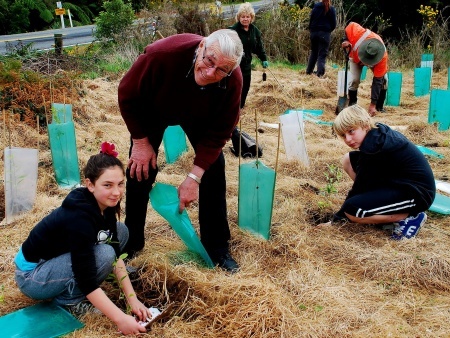 Living Legends contributed to the Punakaiki Coastal Restoration project on the beautiful West Coast of New Zealand’s South Island. 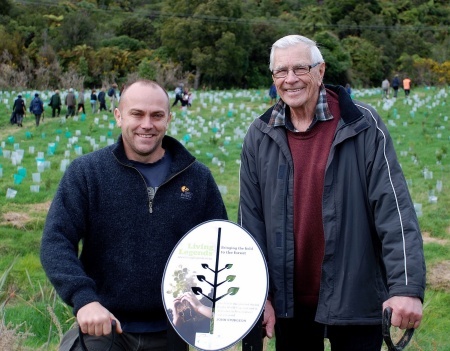 With the help of our volunteers and Rugby Legend John Sturgeon, we planted a total of 10,000 native trees at this site. The Punakaiki Coastal Restoration project aims to make a positive and lasting impact on the social, economic and environmental values of the unique location and focuses on habitat restoration of coastal land adjacent to Paparoa National Park. It’s a partnership between Conservation Volunteers New Zealand and Department of Conservation involving abandoned mining land gifted to DoC by Rio Tinto. The project borders the Westland Petrel Special Protected area, located in the foothills of the Paparoa Ranges. This is the only breeding colony for the Westland Petrel (taiko), a sub-species of the petrel whose presence was first discovered by students from the local Barrytown school in the late 1940’s. To the south, the project site is bounded by the Nikau Scenic Reserve, a small but important remnant of the sand plain forest that once covered the area. The site itself contains some small forest remnants including a large stand of nikau palms, as well as an ecologically diverse wetland area adjacent to the scenic reserve. Restoration activities on the site will see a significant extension of this remnant, providing a now rare corridor or native forest from mountain to sea. At the same time, the planting will enhance the protection of the Westland Petrel’s breeding habitat. The project began in 2010, and aims to plant 20,000 trees a year, some raised on the site and others bought in from local suppliers. There would be few New Zealanders around with a string of achievements in rugby as impressive as West Coast’s John Sturgeon. And the list is getting longer as he has also been named the Buller/West Coast Rugby Legend as part of the Living Legends project. There wasn’t much choice about whether or not John would play rugby he says as he started playing at Te Kinga Primary School on the shores of Lake Brunner. A two classroom school all the boys had to play rugby. From there John has gone on to an illustrious career in rugby. John played rugby for the United Club from 1954 until 1968, the year in which his services to rugby administration began. He started as an Executive Member of Star Rugby club and by 1976 was appointed to the management committee of West Coast Rugby Football Union. From 1984 until 1986 he served as Chairman of the Union, and then returned from 2000 until 2007 in various committee roles. “Join a rugby club and have a friend for life” says John. He has been recognised locally with numerous awards including the West Coast Administrator of the Year in 1987 and the Ron King Trophy in 1988 (for the person who contributed the most to rugby). But it is perhaps for his national roles that he is better known. John was elected to the New Zealand Rugby Football Union (NZRFU) council in 1987 and has served numerous roles, but most recently as President, elected in 2009 and his proudest moment in rugby he says. He also spent many years during the 1980s managing the New Zealand Colts Team, Northern Maori Team and New Zealand Sevens Team before going on to manage the All Blacks from 1988 until 1991. John says managing the All Blacks at test level was one of his greatest times in rugby. John received a Queen’s 1990 Commemorative Medal for service to Rugby, Mining and the Community and was made an MBE in 1991 for his services to sport. And life outside of rugby has also been of great service to sport in New Zealand, John also serves as a Trustee on the Halberg Trust. John says being named a Rugby Legend as part of the Living Legends project is a great honour. “I feel humble, almost overwhelmed and really appreciate the honour”.